Many people who have been arrested and charged with a crime are scared, confused, and have no idea what their next step should be. Having an experienced criminal defense attorney in Fort Lauderdale by your side through the legal process can make or break your case. Criminal defense and civil litigation attorney Mark S. Lowry, Esq. has years of experience successfully representing clients in South Florida, and he is here to help you fight for your rights in court. 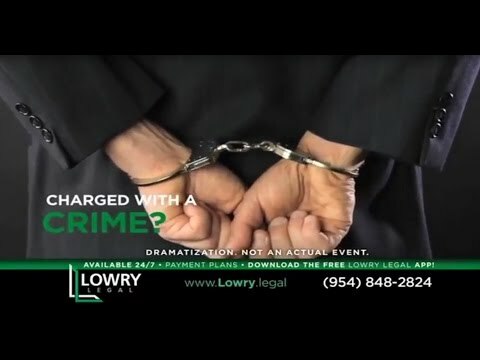 Fort Lauderdale criminal defense lawyer Mark S. Lowry is a former prosecutor who knows what the government needs to prove in order to convict you of a crime. He can ensure that no evidence against you was illegally obtained and keep out any interrogation, search and seizure, or other evidence that violated your constitutional rights. In addition, the office has its own private investigator that conducts an independent investigation of the case to help substantiate your claims. Another benefit of using the law office of Mark S. Lowry is his personalized attention to your case. Unlike other larger firms that might not give your case the attention that it deserves, Mr. Lowry is available 24 hours per day, 7 days a week because he gives his clients direct connection to his personal cell phone and email. He is willing to take your call in the middle of the night and off hours because he understands that not all issues arise during work hours. Finally, Mr. Lowry’s previous criminal defense and civil experience in the law gives him the knowledge and expertise that many other criminal defense lawyers in the Fort Lauderdale area do not possess. He is not afraid to take your case to trial in order to preserve your freedom and rights in the legal system. He will not take a plea deal for his clients simply because it is the simplest solution but will zealously advocate for you with the prosecutor, judge, and other parties involved in your case. Trust the expertise of our Fort Lauderdale DUI attorney to get through tough situations. For the State to prove an accused was driving under the influence of an alcohol beverage or controlled substance, they must prove that the accused was under the influence at the time he was driving to the point that either his “normal faculties” were impaired, or he blew .08 or greater. Despite its name, the Florida crime of kidnapping does not have to involve a child or youth. The crime of kidnapping under Florida Statute 787.01 occurs when a person holds another person against their will through force or threat and with intent to either use the person held for ransom or as a shield, commit a felony, inflict bodily harm or terrorize the person held or another person, or to interfere with a governmental or political function. In short, it’s a two-part crime, requiring the holding of a person and the intent to achieve one of the listed goals. Domestic violence (DV) charges in Florida criminal courts differ from other crimes because of the sensitive and personal nature of the allegations. In Broward County, for example, there are 2 courts that see only DV cases, 1 for misdemeanors and 1 for felonies, because these cases require the Court to examine the relationship between the defendant and alleged victim, and determine whether future violence is likely. The greater Fort Lauderdale area has a large population and an active night life, which draws visitors from across the country. Sometimes, heated arguments, threats, and fights break out in the heat of the moment. “Theft” is a broad term generally used to refer to those crimes that involve the unlawful taking of property. There are a broad array of theft-related crimes in Florida, outlined in Florida Statutes, Chapter 812, ranging from misdemeanor petit theft to felony robbery. Homicide is the killing of one human being by another. Under most circumstances, homicide is criminal. “Homicide” itself is not a crime, but rather a category of crimes; in Florida, these crimes arising out of homicide are governed by Florida Statutes Chapter 782, which lays out the different homicide crimes, as well as some defenses. The nation is in an interesting position with respect to drugs. Nationally, rules relating to marijuana possession are becoming more relaxed, while legislatures and law enforcement work to crack down harder on the illegal possession of prescription drugs. These charges typically go together with other charges, as usually an accused is charged with resisting an officer when fleeing from other criminal actions. If the accused is charged with Resisting With Violence, a 3rd degree felony, the officer would allege that the accused threatened or did violence against the officer while the officer was in his “lawful duties”, like attempting arrest. While being on probation can seem like a cakewalk compared to jail or prison, probation can be very hard for many Defendants to complete successfully, mainly due to all of the conditions of probation he or she agrees to. Mr. Lowry’s primary focus of his practice is Fort Lauderdale criminal defense, in both state and federal courts. Ranging from crimes starting with DUI and other misdemeanors through all felonies in state court, to conspiracy and homicide in federal court, Mr. Lowry has the experience as both a former prosecutor and experienced Fort Lauderdale criminal defense attorney to properly litigate your criminal matter. Should the case need a jury trial, Mr. Lowry has over 65 jury trials in his career, and is therefore more than adequately experienced to professionally litigate any case. His level of comfort in front of a jury is highly regarded by his peers and judges alike. If the client is incarcerated, Mr. Lowry will visit him or her often, knowing that the client has many questions and needs personal attention from their attorney. To request that Mr. Lowry visit a new client, please fill out the online submission on every page of this website and Mr. Lowry will be emailed immediately. Attorney Mark S. Lowry is a former prosecutor with over a decade of legal experience, who is available 24 hours a day and will aggressively fight for your defense. Watch this video for a brief introduction to Mark Lowry at Lowry Legal, and call 954-848-2824 for immediate assistance. Should your case not end as anticipated, Mr. Lowry is an experienced Fort Lauderdale appellate practitioner and can discuss with you the different options in moving forward. Examples of appeals are judicial error, where the judge makes an improper ruling, prosecutorial error, where the prosecutor makes an improper statement before the jury, thereby tainting their perception of the accused, and juror misconduct, where a juror may improperly read about the case in the media and form his or her own opinions about a party before deliberations. After a final judgment or verdict is rendered, the clock starts ticking on when you can file your notice to appeal, often times within 30 days, so be sure to contact Mr. Lowry without delay for a free consultation on your case. If after exhausting all possible appeals you were unsuccessful in reversing your conviction, Mr. Lowry can explore what’s called post-conviction remedies that could potentially overturn your sentence. Examples of these remedies are ineffective assistance of counsel (3.850), where your trial attorney may have made errors, either during the pretrial or trial stage that greatly affected the outcome of your case, or discovering new evidence (3.800), where new evidence is found after the case is resolved that could have changed the outcome of the case. Even if you did not use Mr. Lowry for the appeal(s), he can sit down with you free of charge to discuss this final option to reverse a conviction. If no appeal was filed or after an appeal is unsuccessful, the clock on this type of litigation starts ticking, so do not delay in contacting Mr. Lowry for a free consultation. Civil rights litigation, commonly known as police brutality, law enforcement deprivation of rights, or excessive force, often times go hand in hand with an arrest where the officer used excessive force in searching or seizing the arrestee. Another frequent example of a civil rights violation is when an incarcerated defendant or convicted inmate is the victim of excessive force by the corrections staff. Mr. Lowry is a frequent volunteer with the Southern District’s Volunteer Lawyer Program, representing incarcerated, unrepresented plaintiffs in bringing suitagainst the individual officer(s), the department, city or state, as appropriate. Most civil rights litigation takes place in federal court based on statute and United States Code. Once a deprivation of your civil rights takes place, the time to file your complaint, called the statute of limitations, starts, so do not delay in contacting Mr. Lowry for a free consultation on your potential case.